Being the first born has its pros and cons. One pro: I was daddy’s little girl. Or so I thought. Apparently, my two younger sisters each thought the same thing about themselves. I was a fat little baby who started swimming early in life. I would sit on my father’s shoulders as he walked through Gramercy Park. One time I recall hitting my teeth on a branch overhead, and proceeding to cry and scream my head off because my teeth were bleeding. I was three. As I got older, I got faster in the water. My brother appeared when I was seven and when he became seven he was king of the pool. My two sisters followed. A large part of my childhood was sent going to swim meets with the family. My mother, Dorothea, had no choice. I always wanted to do my best and please my parents, especially my dad. My dad, Coach Leon Katz, taught everybody to swim. He passed his love for swimming on to all of us, particular me. Swimming is both my vocation and avocation. My dad was strong, vigorous, and had an engaging, infectious smile. And would let no new swimmer get away. Today, seven decades later, people still tell me their parents were taught by my dad on the Lower East Side, in the bowels of the Parks Department in “the hood.” I can see my father gathering a group of would-be swimmers, young and young at heart for their first indoctrinations. He taught these inner city kids not only swimming but life’s lessons too. He helped with their science homework or even changing a tire. And he fed them, since he was a cook in the merchant marines where he made 2,000 scrambled eggs a day! I managed to avoid that part of learning to cook. And he would act surprised and turn around and wave. At the Y, he started fitness swimming for adults 50 years ago, way before it was fashionable. For decades, he coached the LENA (Lower East Side Neighborhood Association) swim and track team on the FDR Drive with just a few of us competing and winning against power teams with many more people. He learned to swim after nearly drowning, and become so proficient at it that he made the swim team at Stuyvesant High School, one of New York’s powerhouse teams, and later swam for City College of New York. Despite his swimming prowess, he was an academician by profession. During World War II, he worked at a Westinghouse plant in Pennsylvania, where I was born. And he went to City College, as I did later. He was a professor of electrical engineering technology for 45 years. He and my mother wrote Transients in Electric Circuits, one of the mainstay books on electrical engineering. He created the first electronic piano and wrote about it in the early 1950s. His interest in music came from his parents, who were a concert pianist and a violinist who taught at Carnegie Hall. He and my mother were happy; a busy, educated modestly living couple their entire lives. In his frail state in more recent times before his passing on January 2, 2015, he still had his infectious smile and those great bright eyes that always brought me back to the good old days as a child. 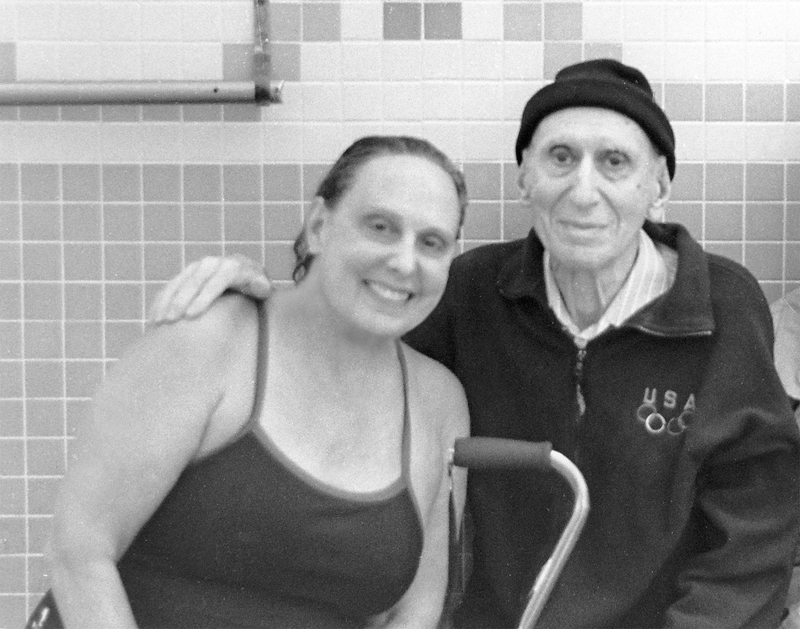 Even at age 90, my dad and I often swam together. And he would say he wanted to time himself; that he was in training. And in the pool, between laps, he would throw a ball like he was ready to try out for the Brooklyn Dodgers baseball team that my mother loved so much. Then he’d start coaching a little one in the pool. I still feel that he’s coaching me. There was something about his heart and soul. He was a good person. His demeanor was priceless. I look forward to swimming with him at a future time in heavenly waters.